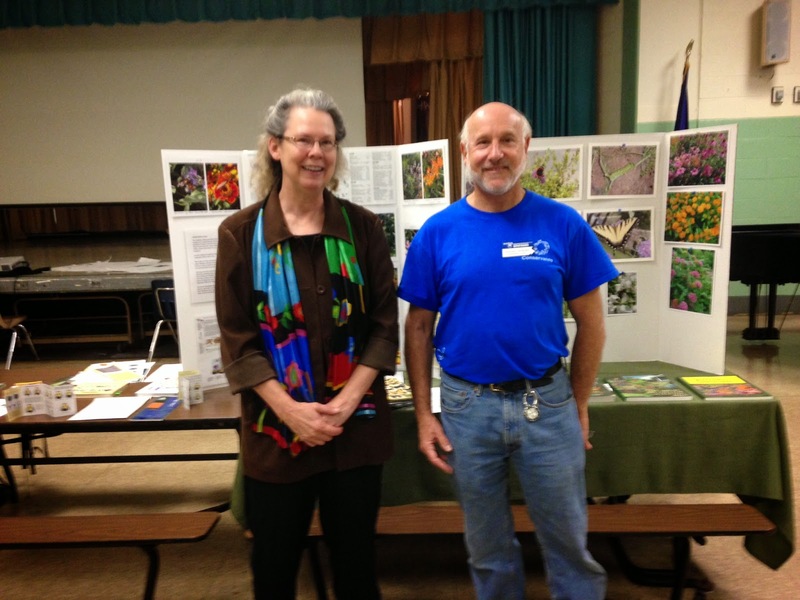 On October 11th, Master Gardeners Howard Goldstein and Karen Melton joined the Cook-Wissahickon Elementary school in Roxborough for their 3rd annual Green Apple Day of Service. The Cook-Wissahickon school has a strong environmental focus and has created a native plant meadow, reduced energy usage, provides recycling drop off for neighbors, and plans to extend the native plantings and replace blacktop with porous materials in the future. The half day event included Howard and Karen's favorite books and photos and a presentation on the importance of native plants in supporting pollinators and birds, as well as the many other benefits derived from a native meadow such as outdoor classroom opportunities for the children and storm water management for the neighborhood. In addition there was a red worm composting demonstration, a workshop to construct hanging planters out of used bottles, information on watershed management, and of course, lots of food!